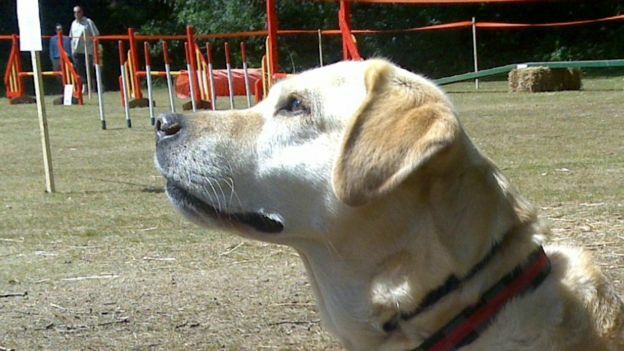 Dogs that can sniff bowel cancer are being used in what is thought to be the first such trial in the UK. The dogs are being trained to detect the cancer by sniffing 2,000 urine and stool samples. Volunteers are being recruited for the three-year study at the Hull and East Yorkshire Hospitals NHS Trust. Dogs have previously been used to detect prostate cancer and changes in blood glucose levels in Type 1 diabetes patients. 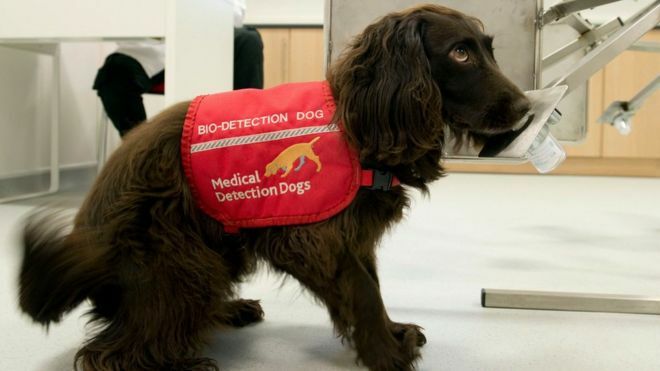 Medical Detection Dogs, a charity which trains the dogs, said the bowel cancer trial was the first in the UK. How do dogs sniff cancer? A dog has up to 300 million olfactory or odorant receptors (ORs) in its nose, 60 times more than a human, who has up to five million. When an odour is recognised, tiny nerves relay signals to the olfactory lobe – the area of the brain dedicated to olfaction – which then interprets the smell in combination with other specialised areas of the brain. Cancer “volatiles” travel from the infected cells into the urine as the body tries to dispose of the chemicals. Dogs can pick up the odour of volatiles in urine and faecal samples at a minute concentration of 0.001 parts per million. There are thousands of different odours normally found in a sample of breath, urine, blood or faeces and the dogs are taught to ignore the other smells and hone in on the cancer volatiles. According to Medical Detection Dogs, training a dog to detect cancer is more complex than teaching the pets to identify explosives or drugs. The charity said a previous study showed trained dogs could detect prostate cancer in urine in 93% of cases. “Colorectal cancer is a lethal disease claiming 16,000 lives a year in the UK,” said Dr Guest. “Colorectal, prostate, breast and lung cancers together account for almost half – 46% – of all new cases.